Once upon a time, shortly after I first arrived in Kigali, I randomly stumbled into this little coffee shop (then named Star Café), looking for nothing more than a cold Fanta after a long run. I ended up having a delicious ham and cheese sandwich and a huge thermos of African tea, and when the bill came I was astounded by the low prices. Since that day, my roommate and I returned to this charming little spot many a time— I mostly returned for the African tea, while my roommate took advantage of the free internet (as long as you order something to eat.) The sandwiches are around Rwf 2,000, and the salads around Rwf 3,000, both equally fresh and tasty! 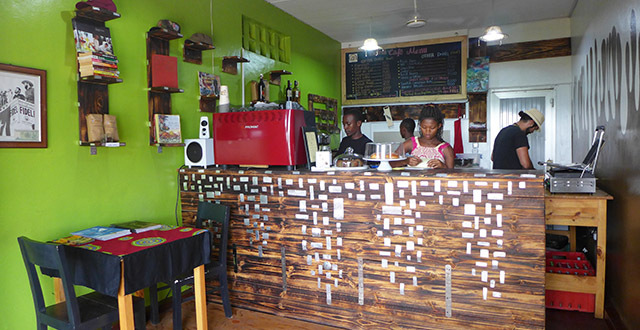 Coffee and tea is not more than Rwf 1,000 and usually comes in a very generous pot. 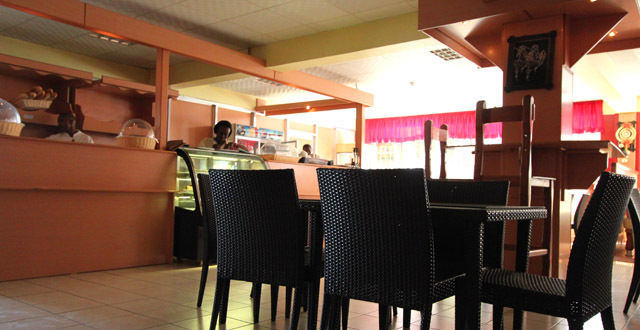 Though it lays slightly hidden behind N’Doli’s supermarket in Kisiment, it is always filled with people (expats and Rwandans a like), so to ensure a place out on the sunny patio, come in good time before the lunch rush, when they have a lunch buffet. One word of warning though: the bathrooms are hideous, and they only flush on good days. But hey, nothing a bottle of anti-bac won’t cure! …and hopefully we’ll all live happily ever after. Or something like that. Hey! i think the coffee place does not exist anymore, or at least we could not find this coffee place and even the few local people we asked for directions had no clue where the coffee shop was… But Canaberra is a coffee shop which fits the description and location so it could just have been re-branded and re-designed a little. Reliable wifi and very good fresh drinks.